César Chávez was born on March 31, 1927, near Yuma, Arizona. He was the second of Librado and Juana Estrada Chávez's six children. His parents owned a store and worked on a farm of over one hundred acres that Chávez's grandfather, Césario Chávez, had established. The Chávez family was kicked off its land for failing to pay its taxes during the Great Depression of the 1930s (when nearly half the industrial workers in the United States lost their jobs, leading to lower demand for goods and services). The family then joined the many migrant (traveling) laborers streaming into California. Chávez quit school while in the seventh grade to work full-time in the fields, but he was not really educated even to that level—he could barely read and write. In 1944 he joined the U.S. Navy and served for two years. Since he was never allowed to advance beyond low-level jobs, he continued as a farm worker in California upon completing his service. In 1948 he married Helen Fabela of Delano, California. Migrant farm workers at that time worked long hours in the fields for very little money. Sometimes their employers would not pay them at all, and there was nothing they could do—nowhere to turn. Many of the farm workers were not U.S. citizens. In an interview with the Farm Worker Press, Chávez remembered, "When I was nineteen I joined the National Agricultural Workers Union. But it didn't have any more success than any of the other farm workers' unions." As Chávez worked in the vineyards (land containing grapevines) and fruit orchards of California, he used his free time to educate himself. He read about famous labor leaders and became interested in the teachings of Mohandas Gandhi (1869–1948), the Indian leader who preached nonviolent resistance in his country's struggle for independence. Chávez, after a couple of failed strikes by his fellow workers, realized that better organization was needed. In 1952 he met Fred Ross, who was organizing Mexican Americans in California's barrios (mainly Spanish-speaking cities or towns) into the Community Service Organization (CSO). The organization concentrated on voter registration, citizenship classes, and helping Mexican American communities obtain needed facilities (such as schools and medical care) in the barrios. The organization also helped individuals with typical problems such as getting welfare, dealing with crooked salesmen, and police injustice. Chávez's work in the voter registration drive in Sal Si Puedes ("Get out if you can"), a rough San Jose, California, barrio, was so effective that Ross hired him as an organizer. Over the next ten years Chávez rose to become national director of CSO. In 1962, when the CSO rejected his proposal to start a farm workers' union, he quit the organization. At thirty-five years of age, with $1,200 in savings, he took his wife and eight children to Delano to begin the slow, step-by-step organizing process that grew into the National Farm Workers Association (NFWA). Three years later, when members of the Agricultural Workers Organizing Committee of the American Federation of Labor and Congress of Industrial Organizations (AFL-CIO) went on strike against the vineyards in Delano, they asked for support from Chávez's NFWA. time against lettuce growers who used nonunion labor. Chávez became the first man ever to organize a farm workers' union in California that obtained signed contracts from the agricultural industry. Chávez was an outspoken believer in Gandhi's idea of social change through nonviolent means. In 1968, to prevent violence in the grape strike, he fasted (went without eating) for twenty-five days. The fast was broken at an outdoor mass attended by some four thousand people, including Senator Robert F. Kennedy (1925–1968). Chávez fasted on several other occasions, including twenty-four days in 1972 to protest antiunion laws in Arizona and for thirty-six days in 1988 to call attention to the continued poor treatment of vineyard workers. Chávez grew dangerously weak after this fast. Another protest involved Chávez leading a two-hundred-mile march from Delano to Sacramento, California, to call attention to the demands of the farm workers. In July 1970 Chávez's union faced one of its most serious challenges, when the Teamsters Union signed contracts that applied to farm workers with some two hundred growers in California. Chávez met the challenge head on: within three weeks the largest agricultural strike ever to hit California had spread along the coastal valleys. About seven thousand farm workers went on strike to win recognition of Chávez's UFWOC as their bargaining agent, with the national boycott again used as the weapon. However, the union gradually lost its strength. From 1972 to 1974, membership decreased from nearly sixty thousand to just five thousand. But Chávez's efforts had made a difference. From 1964 to 1980, wages of California migrant workers had increased 70 percent, workers received health care benefits, and a formal policy for handling worker grievances (complaints) was established. Chávez continued to fight for the rights of workers up until the day of his death on April 22, 1993. He had had nothing but a few glasses of water in the six days before his death. He was elected to the Labor Department's Hall of Fame in 1999 for his work toward improving the treatment of farm workers. Cedeño, Maria E. Cesar Chavez: Labor Leader. Brookfield, CT: Millbrook Press, 1993. Collins, David R. Farmworker's Friend: The Story of César Chávez. Minneapolis, MN. : Carolrhoda Books, 1996. Ferriss, Susan, et. al. The Fight in the Fields: César Chávez and the Farmworkers Movement. New York: Harcourt Brace, 1997. Gonzales, Doreen. 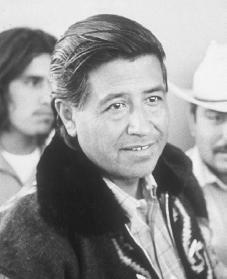 César Chávez: Leader for Migrant Farm Workers. Springfield, NJ: Enslow, 1996. I think that this is very interesting article.. I enjoy reading about all this. and the history that went on in this world. Why was he virtually illiterate in seventh grade? For what reason could he not read nor write? Did your research reveal the answer(s)? You say "he was never allowed to advance beyond low-level jobs" while in the Navy. Did you examine his Navy records? Which Navy individual or individuals didn't allow him to advance? Was his poor education a factor then? I am ashamed of myself for not knowing who this man was. Not even my husband, an Mexican-American, had only vaguely remembered his name, but not why. The article cleared up our curiosity and knowledge of this Great American-Mexican. Even now some Mexican-Americans have a rough time of it with jobs and still get paid less and work harder (then some Americans I've seen) A lot in fear of losing their jobs. I teach basic Spanish and Hispanic history and culture to grades 1-6. The main reason students do not know very much about Cesar Chavez is because he does not have a national day of recognition such as Washington, Lincoln, And MLK. Chavez was Mexican American and during the time period of the grape boycott, his peaceful protests were largly overshadowed by three other important movementsof the 1960's, including the peaceful protests and violent backlash taking place in the South East regarding the Civil Rights Movement, protest against Vietnam, and the emerging drop out hippy movement which the World War II generation could not comprehend. A grape boycott believed to be primarily for the benefit of Mexican Workers unfortunately was not viewed as news worthy as the other three movements of high interst to the public. In fact, I believe Chavez's willingness to fast for 25 days is the main reason migrant farm workers were finally granted four simple basic rights. Chavez's advocacy for fair wages, bathrooms, clean drinking water, amd lunch breaks for migrant farm workers later expanded to include all living creatures through his advocacy for the ethical treatment of animals and discontuing pesticides suspected to cause lomg term health problems just prior to his death. He is the epidamy of an international hero including the work of his partner Delores Huerta who we know of even less. There is currently a petition online to help establish a national day of recognition for Chavez. Texas, Colorado, amd CalifornIa are currently the only states I'm aware of that have a day of recognition for Chavez. A national day of recognotion would spread the word throughout the country about his important work as well as the work Delores Huerta continues to this day. This would also ensure that social studies and American History curriculums incorporate yearly lessons regarding the work of both Chavez and Huerta. You will find a great 2 min video perfect for kids and adults as well as the petition at the takepart website. Im not allowed to actually include the website or link. Unfortunately, in over a year, the petition has not even receiced half of the needed 100,000 signatures. If we all work together to spread the word, we will successfully become part of Chavez's movement and will feel a great sense of pride when a national holiday is finally established for this great man!